Monensin is a lipid-soluble naturally occurring bioactive ionophore produced by Streptomyces spp. Its antimicrobial activity is mediated by its ability to exchange Na+ and K+ ions across the cell membrane thereby disrupting ionic gradients and altering cellular physiology. It is approved by Food and Drug Administration as a veterinary antibiotic to treat coccidiosis. Besides veterinary applications, monensin exhibits a broad spectrum activity against opportunistic pathogens of humans such as bacteria, virus, fungi and parasites in both drug sensitive and resistant strains. This ionophore can selectively kill pathogens with negligible toxic effect on mammalian cells. In this review, we discuss the therapeutic potential of monensin as a new broad-spectrum anti-microbial agent that warrants further studies for clinical use. Keywords: Monensin, Anti-microbial, Ionophores, Pathogens, Chemotherapy, Drug-resistant. Keywords:Monensin, Anti-microbial, Ionophores, Pathogens, Chemotherapy, Drug-resistant. Abstract:Monensin is a lipid-soluble naturally occurring bioactive ionophore produced by Streptomyces spp. Its antimicrobial activity is mediated by its ability to exchange Na+ and K+ ions across the cell membrane thereby disrupting ionic gradients and altering cellular physiology. It is approved by Food and Drug Administration as a veterinary antibiotic to treat coccidiosis. Besides veterinary applications, monensin exhibits a broad spectrum activity against opportunistic pathogens of humans such as bacteria, virus, fungi and parasites in both drug sensitive and resistant strains. This ionophore can selectively kill pathogens with negligible toxic effect on mammalian cells. 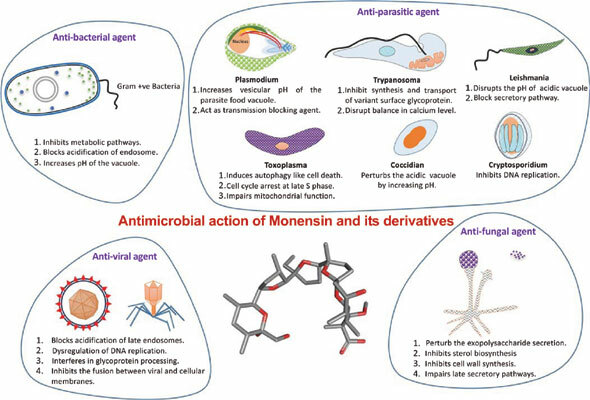 In this review, we discuss the therapeutic potential of monensin as a new broad-spectrum anti-microbial agent that warrants further studies for clinical use.